Dental emergencies are typically sudden and unexpected incidents that may leave you feeling panicked. 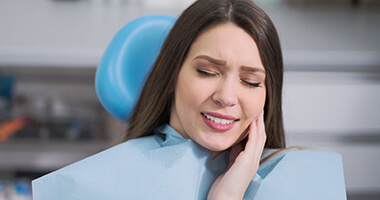 When severe oral pain or a traumatic injury affects you or a loved one, it can make all the difference in the world to know that you already have a trusted dental team to turn to for support. At Island Daily Dental Care, we’re here for our patients through thick and thin. That’s why our practice is open seven days a week, including early morning and late evening hours! If you’re on Long Island, don’t hesitate to contact our Medford, NY doctors and staff right away for emergency assistance. Be sure to keep up with regular checkups and cleanings at Island Daily Dental Care! These visits are the most effective way to keep the minor concerns from becoming the troubling emergencies. Exercise caution when eating foods that are particularly tough or sticky, and never chew ice or bite your nails. Always use scissors to open difficult packaging materials instead of your teeth. Be sure to wear a mouthguard/sportsguard when participating in sporting events to keep your teeth safe from physical contact.